I made this cake for the finale to Sunday dinner a few weeks ago, using the same vanilla cake recipe Bri has used for her Dreamy Cake. 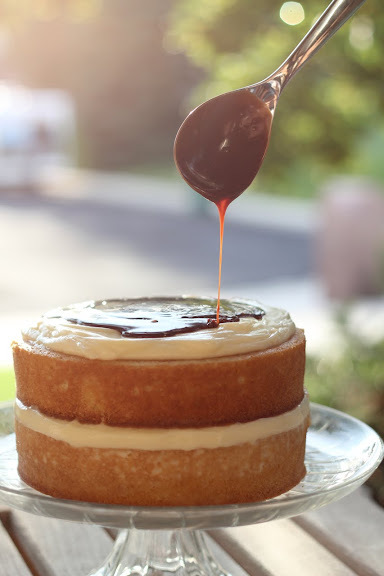 This cake is so easy to make and the results are amazing! It is DELICIOUS! And super easy on the eyes! Just looking at the pictures makes me want a slice! For the cake: Preheat oven to 350 degrees. Line bottom of two 8 inch pans with parchment and then pam the sides of pan and over the parchment. In a large bowl with an electric mixer, beat the butter and sugar until light and fluffy. With mixer on low, beat in eggs, one at a time. Beat in vanilla. Alternately beat in flour mixture and buttermilk, beginning and ending with flour mixture. Mix until just combined. Divide batter between the 2 prepared 8 inch pans. Bake for 32-35 minutes until cakes are slightly golden and start to pull away from sides. Let cool for 10 minutes in pans and then turn out on cooling racks to cool completely. Mix until thickened. Place 2/3 of the pudding on top of first cake layer. Place second cake layer on top of pudding. Spread remaining pudding on top of cake. Pour chocolate chips into medium bowl. In a small pan, over medium heat, bring cream to just shy of boiling. Remove from heat and pour hot cream over milk chocolate chips. 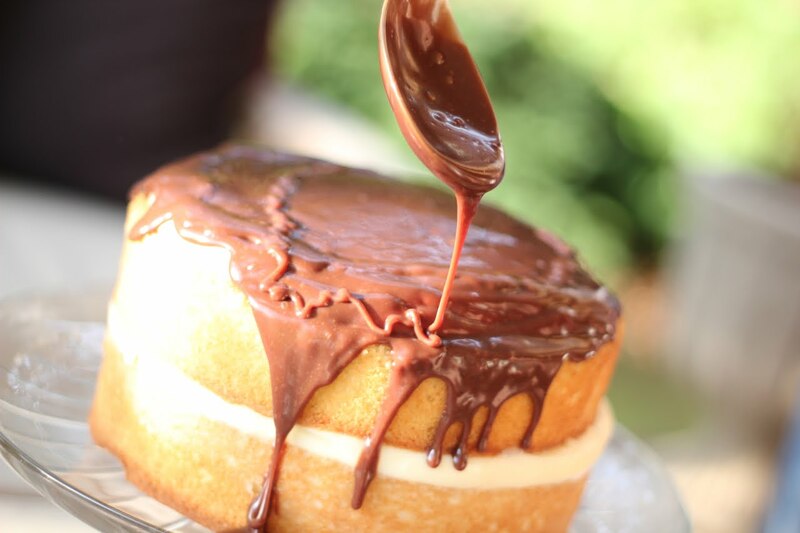 Allow chocolate to begin to melt for a minute or 2 and then begin whisking to turn it into a beautiful and glossy ganache. Cool slightly in fridge(about 10 minutes) before drizzling over top of cake. Refrigerate finished cake until ready to serve. I need to go work-out now. Kara! You've got to stop all this delicious dessert nonsense! I'm going to go work out with Bri. After I lick the spoon in those pictures. I LOVED this recipe! I liked it so much that I posted it on my blog. I have been testing many of your guys' recipes and they are all awesome! Keep up the good work!